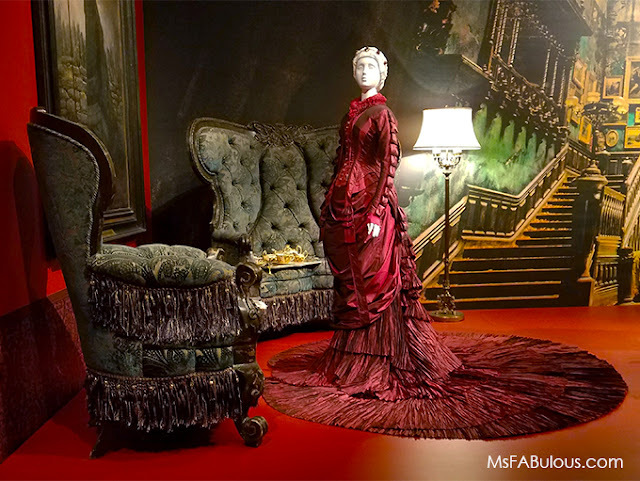 I am giving you a dose of stylish spookiness today with Guillermo Del Toro’s At Home With Monsters exhibit at the Art Gallery of Ontario. 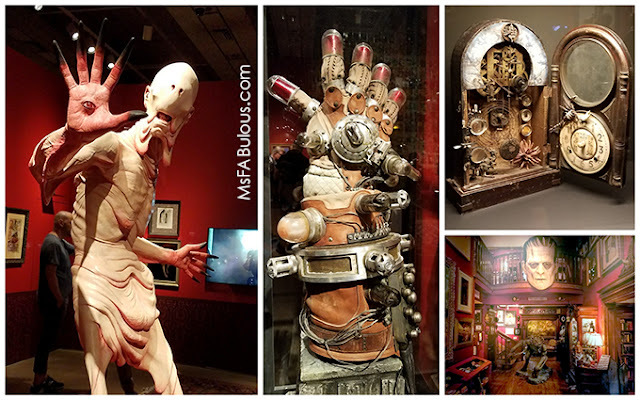 This was the perfect art show for October, with the film director’s personal collection of monster, art, and film memorabilia. The auteur behind movies like Hellboy 2: The Golden Army, Pan’s Labyrinth and The Devil’s Backbone has been obsessed with Frankenstein, insects and creepy art from a young age. He loves comic books and empathizes with the outsider and freaks. The exhibit was a beautifully curated cabinet of curiosities, inspired by the mansion/museum that he keeps this amazing collection in. There are antique pieces of mourning photographs and jewelry. There are contemporary comic and storyboard art from his work and others that inspire him. For fashion, there was a vignette of the stunning costumes from his Gothic style masterpiece Crimson Peak. It let you examine all the delicate details that helped tell the story’s characters. Antiqued applique leaves down the front of the teal velvet jacket. The exaggerated lacing down the back of the vivid red dress worn by Jessica Chastain to emulate the spinal column and herald death. My favorite piece (costume? Sculpture?) 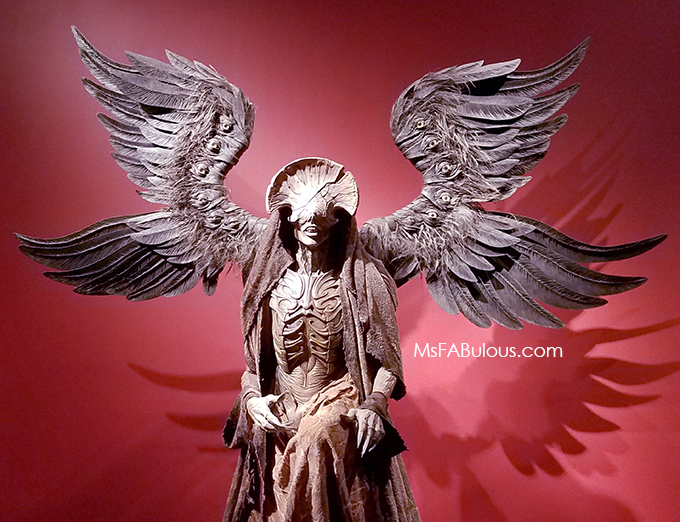 was the Angel of Death from Hellboy 2 (top). There was something elegant about this horrifying character. Del Toro explains one of his signature tricks is to relocate eyes to unexpected areas of the character because it instantly disturbs and makes people uncomfortable. This method was used very effectively with the Pale Man of Pan’s Labyrinth. The director describes how this beast now represents the toxicity of white male superiority to him. There is a bit of Steampunk style in Del Toro’s work. Look no further than the character of Johann Krauss in Hellboy 2. Check out all the gears and gadget that go into just one arm. Lots of mechanically inclined creatures make their way into his films and art. Unlike some artistic directors, Guillermo Del Toro has a great sense of humor. The art, the characters, the monsters are not to be taken too seriously (just take a look at the musical number of Hellboy 2). The creepiest of monsters have a charm to them that makes you smile. He even has a rain room in his house where his special effects expertise has rigged an office to be lit and sound like a rainstorm whenever he wants to work. How much fun was this? Guillermo Del Toro’s At Home With Monsters was the perfect dose of high/low culture for your Halloween inspiration.